So, I'm sitting in my new watercolor class watching the instructor give a 20 minute demonstration on how to apply masking tape to paper. It is STULTIFYINGLY BORING. No one in the class is allowed to do anything but watch this useless activity. When the teacher is done, she passes around the tape so we could do the same. But there is only one roll and so now I must wait another 20 minutes before the tape appears to me. 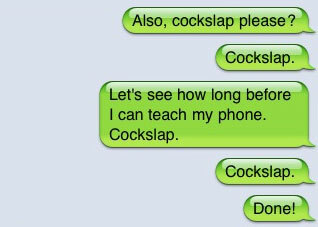 You would teach your phone how to spell "cockslap" right? What?? It makes perfect sense. Motivated by the below autocorrect fail, I wondered how long does it actually take the phone to learn profanities? 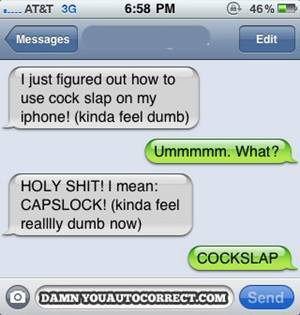 How else would it take a typo of "capslock" to be converted to "cockslap"? A research experiment was in order. After TWO TRIES it appeared to get it! I wanted to be sure though so I overdid it. 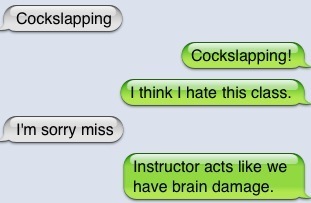 I think I just like saying "cockslap." The masking tape was still halfway around the room so I experimented with various tenses of the verb "cockslap." Friend: You realize that actual cockslapping is not really a desired activity in a bedroom, right? Me: Totally. I just like saying it. LOL this is hilarious! I've been hitting "Next Blog" for about a week now, trying to find a blog that wasn't about oh so happy families (gag), design, or dogs. Glad I found yours. Some people may be into that sort of thing. Reluctantly... no, vehemently agreeing with Plummer.